As you can see from my picture I didn’t do a very good job of rolling my pinwheels. I was running out of time. My guest were about to start arriving and needed to move quickly. These turned out fantastic, but they were super-hot. I think next time I would cut the amount of jalapenos in half. If you like spicy hot then you will love the recipe just the way it is! 2. Add cream cheese into a bowl along with diced jalapenos, and sugar. 3. Take your fork and mash it all up really well. Be sure to incorporate all that sugar in really well and set side. 4. 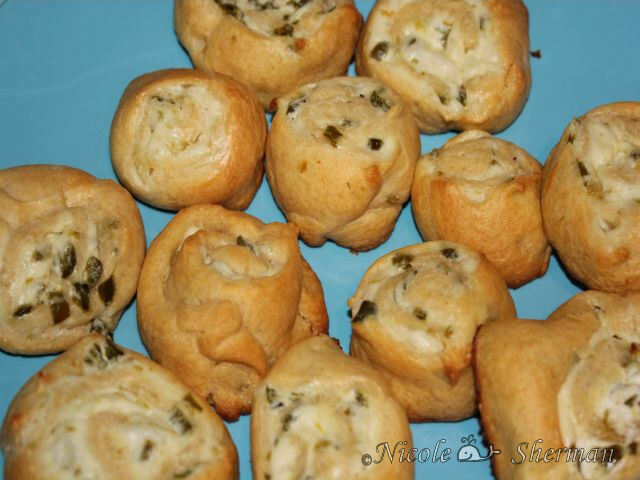 Open up your tube of crescent rolls and place on your cutting board. 5. Separate them into two rectangles. Now pinch together the perforations to create two nice rectangles. 7. Spread your half portion of cream cheese on one of your rectangles, start with the long end of the roll, and get to rolling. Once it’s all rolled up, you will need to cut your log into 16 pinwheels. 9. Bake for 12-15 minutes or until golden brown.